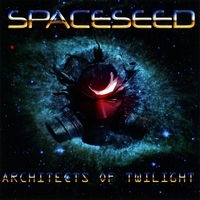 Spaceseed - "Architects Of Twilight"
Their "Basement Demo-lition" EP had a couple great heavy space-rocking tunes, so I was pretty anxious to hear this full-length (their second? ), especially considering contributions from ex-Hawks Bridget Wishart and Harvey Bainbridge. I love the packaging, the intent of pure heavy synth-smothered space-rock interspersed with magick and conspiracy-laden spoken-word interludes, but the overall outcome is a little disappointing, these tunes being pretty standard and Harvey's vocal contributions not being his strongest (not that they've ever been exactly great, but he's had his moments). You've got a couple heavily layered keyboard pieces which are so-so. The first proper song, "River In the Sky", does boast some pretty wild squiggle-synth work and you'll expect some lyrics, but it's instrumental (save Harvey's later monologue) - you might wanna try singing "Master Of the Universe", it would probably fit! Some of the more distinct atmospheres established are in the spoken bits like Bridget's intro-piece and "Blood On My Hands", which sets an effectively creepy mood. "The Insane Scientist" has some bitchin sludge riffage and the group-vocals (sped up to sound like a creepy minion) are pretty cool. Again, I like the heaviness but some of these riffs have just gone around a few too many times to sound that great anymore.